SOS Aloha is approaching its second anniversary on March 3. I believe it is more than a book blog .... it is an Ohana (family) of readers who share book thoughts, encouraging words, and good cheer. Today I invited Mary, one of my regular commenters, to join me for a cozy chat as she is also an Internet Personality! Kim: I am curious about your thoughts on your home town, Las Vegas. What is your favorite sight, sound, and smell? Mary: I've lived in Las Vegas now for about 23 years and I can honestly say that seeing the lights of The Strip at night is still my favorite sight. There's really nothing like it. The sound and smell that first came to mind when asked this question was the sounds of the trickling water in the washes and the smells coming from the water, wet sand, dirt and desert foliage out at Red Rock or Mount Charleston, especially just after winter when the snow is melting and the washes are trickling down getting everything in its path wet. Kim: Do you remember how you found my blog, SOS Aloha? What do you like to read? Mary: I found your blog through The Reading Reviewer as I was entering contests on the different blogs a couple of years ago. For a while I just read your blog and didn't comment (Sometimes I like to lurk and read the posts for a while before commenting) and then started commenting because I really liked the different posts you were making. I now visit more than 160 blogs each day because there are so many funny, thought provoking or interesting posts I just have to read. Right now I am going through a Paranormal Romance obsession. There are so many great authors that write paranormal's and I just don't have enough time in the day to read all of the books I have or want to get. I like Pamela Palmer, Sherrilyn Kenyon, Laurell K. Hamilton, Kerrelyn Sparks, Gena Showalter and many others. Kim: Tell us about your blog, DARK THOUGHTS (at this link) - why did you start it? Do you have any advice for others interested in starting their own blog? Mary: Back in 2005 a few of my online friends and I decided to start up blogs so we could keep in touch and read what was going on in each other's lives. Now in 2012 I'm the only one of the original group that still updates a blog. Now everyone uses facebook or a yahoo group or just email to keep in touch, but I really like updating my blog each day with whatever happens to pop in my head. That's really how I decide what the topic will be each day. I don't have a specific theme I go by like a lot of people do, I just fly by the seat of my pants adding things I like, dislike and things I think others might like to see. If someone wants to start a blog, just do it. You don't have to have anything specific in mind to write about, you just have to start writing. Back when I first started writing on my blog, I just wrote about what ever happened that day, my neighbors, my daughter or the animals. As time went by, my writing got better (at least I think so) and more people started reading (I can tell by the stats counter) and commenting. And I'm glad you care enough about your daughter to be a creeper. Mary: Ha! My daughter thinks it's funny as heck that she called me a creeper for reading her friends facebook pages. I wrote a blog post about it which I found funny. I figure if people don't want strangers reading the things they put on facebook, they will have private pages. If you have a public page and happen to be a friend of my daughter, my brother's, cousin, friends, friends of friends ect.. expect that I have already been to your facebook wall and read your status updates, seen all your pictures and even checked out your friends pages. Yes, I am a creeper. 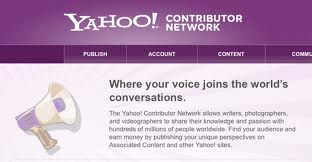 Kim: You are also a member of Yahoo's Contributor Network - what is that? Mary: The Yahoo Contributor Network is a site where anyone can write articles about just about anything and if they are accepted...they can get paid for them. So now I write about my passion, small animals and how to care for them. I have 4 male rats right now and if you've read one or more of my articles you are likely to see them in the pictures I use for my articles. I get all my ideas for articles from my pets and what I've had to deal with while having them. I have written a few articles on other things that come up in the news or things that grab my attention and I feel need a voice, things that I feel I just need to talk about. But most of my more than 200 published articles are about Small Animal Care and I've had a lot of fun writing them. I love reading the comments and questions on the articles I've written. Now on the site that I publish my work, The Yahoo Contributor Network may do things different than other freelance writing sites and I know ther are a few of them out there. Here are a few answers to questions that I get all the time. How much do you get paid? When I submit an article it usually takes anywhere from a few days to two weeks for them to get back to me with an offer. My offers are anywhere between $3.00 and $6.00 per article and then I also get a set amount for page views. My page view performance is $2.00 for every 1000 page views my articles get. How long does it take you to write an article? If I am writing about a subject that I am Knowledgeable about, it will take me about an hour. If I have to do research for the article to find facts, sources ect, then about 2 hours. Kim: Thank you for caring about animals! Can you share a heartwarming story about your experience? Mary: I wrote an article a few years ago about hamsters and this little girl wrote me a question in the comments section that had me in tears. She wanted to know is her hamster was still sick or if he was happy after her mom took him to the veterinarian and had him put to sleep. I told her that he was not sick anymore and was very happy to be playing with all the other hamsters that were there where he was. Her mother wrote me a private email a few weeks after and thanked me for cheering her daughter up, who I found out was only 9 years old. The article she commented on can be found here. 1. Leave a comment about a topic that you could write an article for the Yahoo Contributor Network. I could write about traveling around the Hawaiian Islands! 3. Comments are open through Saturday, February 25, 10 pm in Hawaii. I'll post the winner on Sunday, February 26. To learn more about Mary, check you her blog, Dark Thoughts, at this link. Plus check out her articles on the Yahoo Contributor Network at this link. Continuing the culinary war between Hawaii and Paris, I ventured to Chinatown with the Hickam Travel Club, aka, Renee, Nadja, and Ivy. First stop, Liliha's Bakery for coco puffs (read this link). Rest assured, our stop had an "Asian theme." Upper left, chocolate topped, creme filled puff. Upper right, creme puffs, sugar topping. Lower left, green tea creme filled puff. chocolate cream filled with cream topping. Ivy helped her mom, Nadja, picked out the puffs. You can guess which is the green tea. It wouldn't be Hawaii without pineapple! 10 minutes later, we arrived in Chinatown. It grew from its proximity to the commercial piers. she swam away from them as they can bite. ... and Longan. Both are native to Southwest Asia. ... with the "card catalog" drawers. ... we found haute couture. rented rooms during shore leave. Do you have an ethnic neighborhood near you? One randomly selected commenter (from this week's blogs) will win a WHY HAWAII RIVALS PARIS gift box. It may include a few trinkets from Chinatown! This giveaway is open to all readers. Comments are open through Saturday, February 11, 10 pm in Hawaii. I'll post the winner on Sunday, February 12. 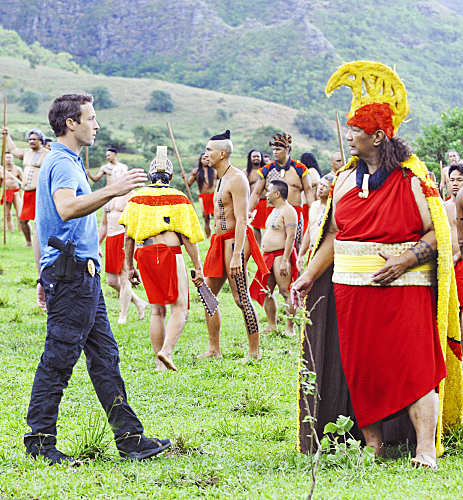 We waited for Danno and Chin Ho.